In this post, we will look at a relatively old concept in automobiles but the one that is yet to see the daylight in Indian heavy transport segment. We will talk about rigid axles vs steerable axles. What is the need for steerable axles? Well, when talking about the front axle the answer is quite obvious. But what about the rear axles. Do they need steering as well? 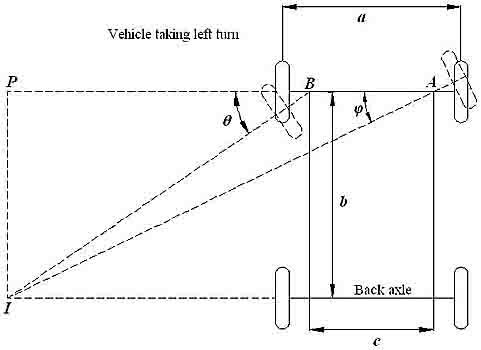 Schematic showing the geometry of a vehicle taking a left turn. Looking at the image on the right we can see that a vehicle takes a turn about an axis of rotation and for all the tires to roll without sliding sideways it is necessary for them to be exactly perpendicular to the line joining the axis of rotation and the center of the tyre. This is the basic reason why the inner wheel of the front axle turns at a higher angle than the outer wheel. sideways slippage. 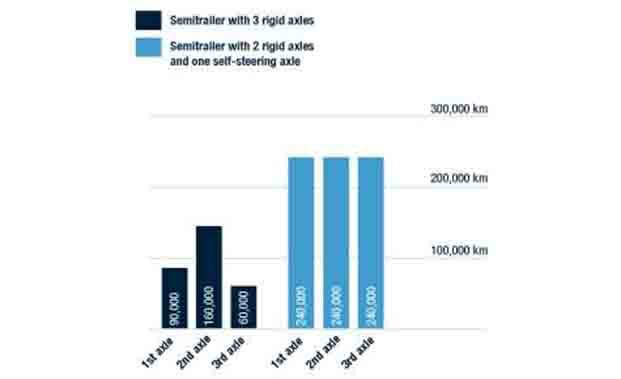 The above image shows an estimate of tyre mileage with and without steering in one of the axles (third axle) in a three axle trailer. This of course also causes additional wear of the pavement surface. The vehicle swept path i.e the area that a vehicle requires while making a turn is substantially increased with rigid axles. This can clearly be seen in the below image. Swept Path with and without Steerable Axles for Trailer. 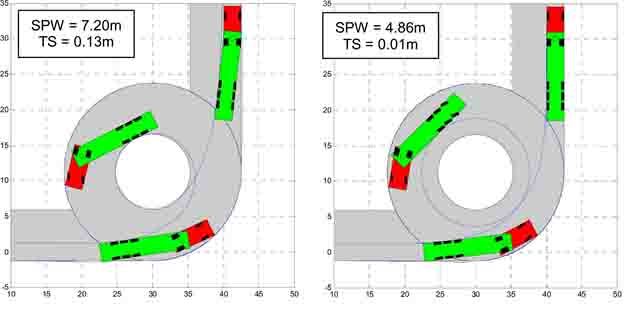 SPW = Swept Path Width and TS = Tail Swing (i.e. by how much the tail swings out of the path of the tractor). The sliding of wheels adds to the resistance to motion. This increases the engine effort to pull the same load at the same speed which in turn increases the fuel consumption. The image shows that the fuel saved with steering systems could be about a liter per 100 km for a distribution haulage vehicle. This means that the system would eventually pay off itself with the costs saved in tyre wear and fuel. The slipping and sliding of wheels will also exert excess lateral forces on chassis which can limit the weight carrying capacity of it as the maximum load that it can carry without these unnecessary forces will surely be higher. What are the various mechanisms for steering axles? Free Castering Type: Caster is the angle that the axis of rotation of wheel makes with the vertical when seen in side view. 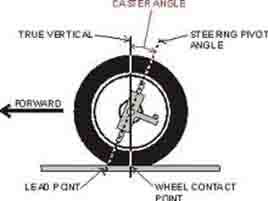 The wheels of office chair aligning automatically with the direction of motion of chair is a simple application of caster angle. In free castering type, the wheels are given a caster angle that causes the wheels to steer freely when the vehicle takes a turn. The centering force is not good enough in this type of mechanism hence the high-speed performance and also stability while braking deteriorates with this type of steering. Also, when taking reverse the wheels need to be locked to prevent damage to the axles as wheels tend to take a 180o turn. Automotive type: This type of mechanism is similar to the free castering type except for the fact that it has a mechanism that helps to increase centring force. This increases stability in high speed as well as while braking. In the above image the mechanism that helps to increase the centring force is shown. These axles also need to be lifted or locked when reversing. 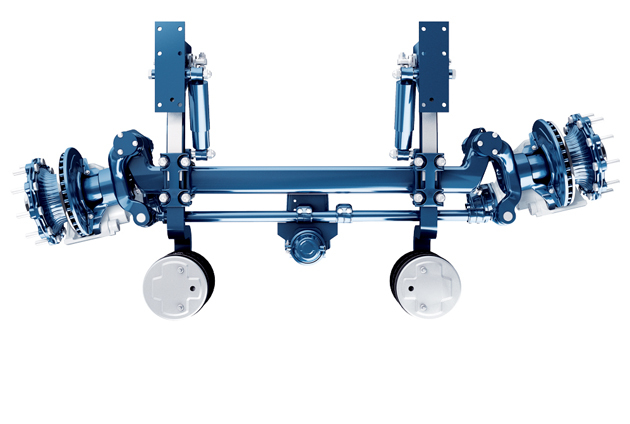 Linked Articulation Type: A force-steering axle type that uses a steering linkage mechanism that alters the steer angle of an axle group as a function of fifth wheel articulation angle between the vehicle unit, the axles are attached to, and the hauling unit. This type of axles are costly and complex compared to the automotive type but have smaller swept path, lower high speed off tracking and higher stability. 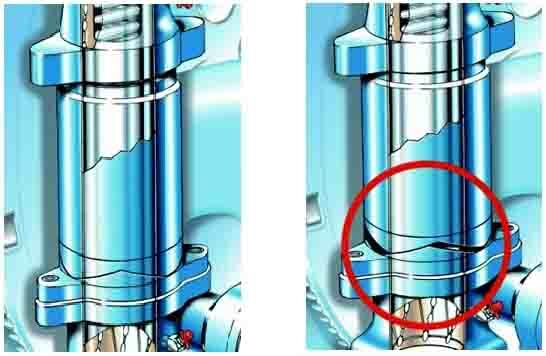 Hydraulically Steered: In this type, a couple of hydraulic single acting cylinders are attached at the fifth wheel of the vehicle which reciprocates with the relative motion between the hauling unit and trailer. This motion is transferred to hydraulic cylinders fitted to the axles in the trailer. This type of mechanism also provides lower high speed off tracking and higher stability. What are the applications that its suited for? Distribution haulage is one application where this can prove to be of great use. In India, the in-roads are usually too narrow for trailers, but with steerable axles, maneuverability is not a big issue. So trailers with steerable axles can be used for distribution purposes in cities instead of fixed container trucks which means more goods transferred per trip i.e. 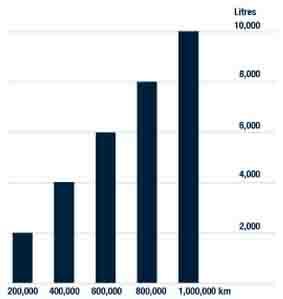 less cost of fuel per unit transported. In times when our government has introduced FDI in retail, this could actually prove to be very useful. Also in these applications, the vehicle has to take a lot of slow speed corners where steerable axles could help to reduce tyre costs. Greater maneuverability is one advantage that could come in handy transporting long cargos in hilly areas. 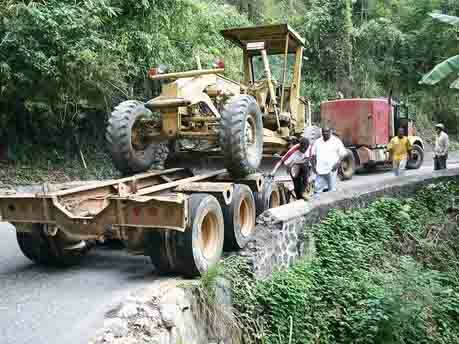 The rigid axle trailers face a genetic disadvantage in these conditions as shown by the below image. Transporting something like wind mill turbine blades through hilly regions of India using trailers with steerable axles would become much easier as the swept path is greatly reduced. There are also some disadvantages associated with the new technology. First the increased complexity would increase the maintenance cost and require more skilled mechanics (but in contrast require less skilled drivers). Also, in most steering types high-speed stability is compromised. Further, to bring this new technology would require a new Gazette and many regulations amendments in CMVR which is a very slow and tedious procedure in India. Amendments in CMVR for Hydraulic Modular Trailer’s which were introduced about 2 decades ago have only been made recently. Steerable axles could help increase the number of axles in a trailer without increasing the tyre scrub. This could increase the GCW of the vehicle and help decrease the overloading menace. Also, this could help fit heavier axles at a greater distance without affecting the low-speed performance. Nimbus Logistics has in-house mechanical engineers and industry experts, which helps us be in sync with the latest technology and developments happening around the world. This helps us provide innovative and cost-efficient solutions to our clients. Nimbus Logistics is an ODC and Heavy transport specialist with more than 4 decades of experience transporting Super Heavy and Super ODC cargo. We believe in ethical logistics and transparency. These articles are one of our initiatives to bring more transparency to the much chaotic Indian Transportation Industry. Please support us by sharing our articles and like our facebook page to be the first one to read all our future articles. Deepak Aggarwal on What is “Over Dimensional Cargo” or “ODC”? https://www.cialissansordonnancefr24.com/ou-acheter-cialis-serieux/ on What is “Over Dimensional Cargo” or “ODC”? D.P. Verma on What are the various costs associated with ODC?